As I was reading farewell posts for 2016 (or celebratory ones for 2017), I’ve noticed that many people were very unhappy with the year and were anxious to see it off. While I acknowledge all the madness and unpleasantness that the year had brought us, on the personal level I don’t have much to complain. All-in-all, it was a good year for me, and I’m grateful for that. But let me show you my 2016 in numbers. Northern California finally got some relief from the drought we are having. It’s still not over, and a part of the state is still in miserable condition, but the area where I live got rainfall between 98 and 100 percent of historic average, which makes me happy (I’m not sure about Rusty, though: since the picture below had been taken, he’s developed an inexplicable phobia of umbrellas – so that he refuses to be in the same room with it. Now I have to dry umbrellas in the garage not to traumatize him any further). I wear perfumes on most of the days that I work from the office and on weekends. When I work from home, I tend to use those days to test perfumes instead of wearing my favorites. Since at the new job I get less WFH days, 2016 numbers for perfume wearing went up compared to 2015 (the difference is given in parentheses): I wore 164 perfumes (+8) from 61 brands (+5) on 333 occasions (+29). And before you ask: no, I do not own 164 bottles of perfumes; some of these are travel bottles, minis or decants. For many years I have been a Jo Malone’s fan. It started long before my trip down the rabbit hole but during the first several years of my descent I was so mesmerized by all the marvels of the niche perfumery world that I wore much less of my favorite perfumes from this brand even though I own more full bottles from Jo Malone than from any other brand. 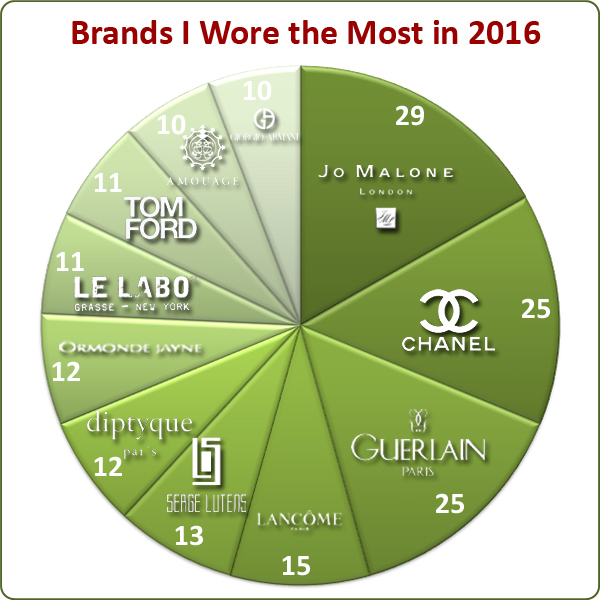 Since I wasn’t doing my monthly statistics posts this last year, I haven’t noticed the tendency, so it got me by surprise when my year numbers showed that Jo Malone was the brand I wore the most often, and it was the highest number for one brand in the last three years: I wore Jo Malone’s perfumes on 29 occasions. This is how many times I wore Lancôme Climat – my all-time favorite perfume in 2016. You might think it’s not a high number for perfume that I love my whole life: just 13 days out of 365… no, actually 366. But look at it from another perspective: this is the highest number for any single perfume I wore during any of the past six years. Despite being very busy and wearing perfumes more often, in 2016 I did a lot more testing (compared to 2015): I tested 275 perfumes (+ 97) from 100 brands (+15) on 361 occasions (+134). Not all the testing I’ve done was for new perfumes, I do a lot of comparison testing (e.g., a new to me perfume with the one I own or two new perfumes against each other) or just re-testing something I’ve tested before. But I did test 118 new for me perfumes (+26), 31 of which were released in 2016 (+3), and I listed 10 of the new releases that I liked in the last post of the year. Care to guess, which line I tested the most? Told you – “with a vengeance.” I was surprised myself, and I blame it on their Garden Collection: probably I just couldn’t believe I couldn’t find a single perfume to like in those cute green bottles, so I kept trying them. 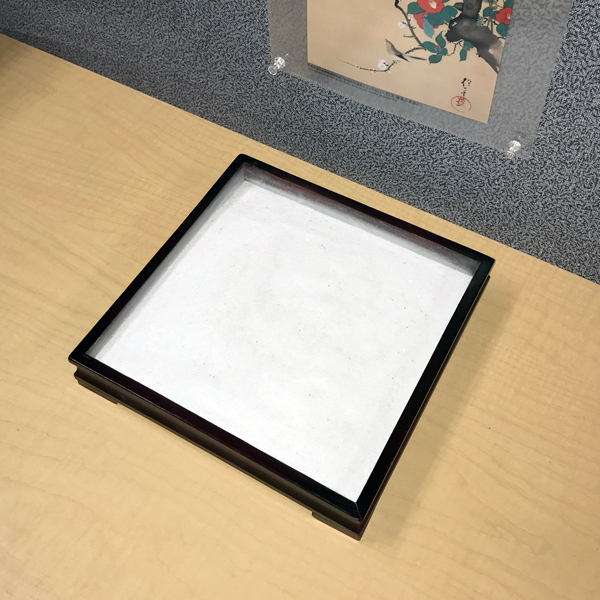 A year ago I changed jobs and I got myself a desk Zen Garden, about which I dreamed for years. Looking back, I can tell that it was a good decision. On both accounts – the job and the garden. It was a challenging busy year but I enjoy what I do, I like my job, and I still had time for changing my Zen Garden at least seven times (I can’t find a picture of the very first one I made but it was more traditional than the next six). As you can see, I used all my favorite things – cats, perfumes, chocolates and holiday decorations. Yesterday I took off Christmas ornaments, and I’m ready for the next chapter in my Zen-gardening. Any ideas for what I should do next?